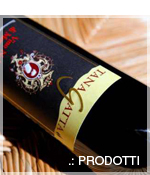 Sangiovese 80%, Canaiolo nero (black Canaiolo) 15%, Mammolo 5%. Traditional wine-making in steel casks; 15-18 day maceration at controlled temperature. Aged in Slavonian oak casks for 36 months. After bottling, the wine is kept in the bottle for at least 3 months before being marketed. This harmonious, stout and full-bodied wine perfectly blends the characteristics of Sangiovese with the peculiar features of the Geographical Area of Montepulciano. Ideal matching: red meat, game and typical Tuscan dishes.